This is a very easy, and very satisfying breakfast. It’s also an amazing way to get rid of the hangover you have from all the wine you drank with the steak dinner the night before (so I’ve heard…). 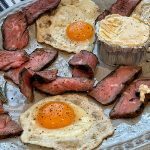 I typically like to do this on my outdoor griddle, but you can also do this recipe on a cast iron skillet. 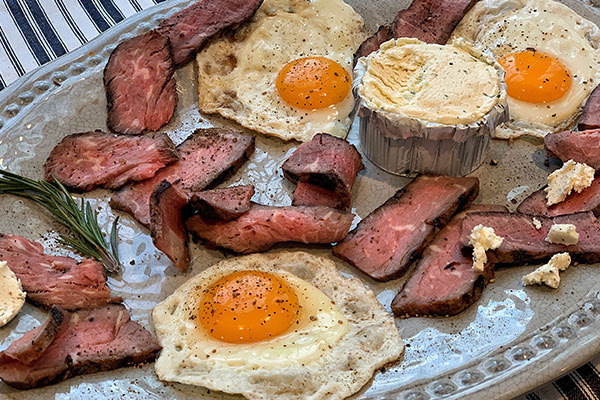 Add whatever sides you want to this—fried potatoes and onions are excellent accompaniment to the steak and eggs, some soft spreadable cheese (one of my favs), or even a fresh arugula salad. Oh, and don’t forget the black coffee, that helps with the hangover, too. Finally, don’t limit this to just leftover steak, this is something that can be done with a thinly sliced breakfast steak as well. Serves: 2 | Prep time: 5 mins. | Cook time: 5 mins. Cast iron skillet or outdoor griddle. Step 1: Slice cold steak in 1/4 inch thin slices. 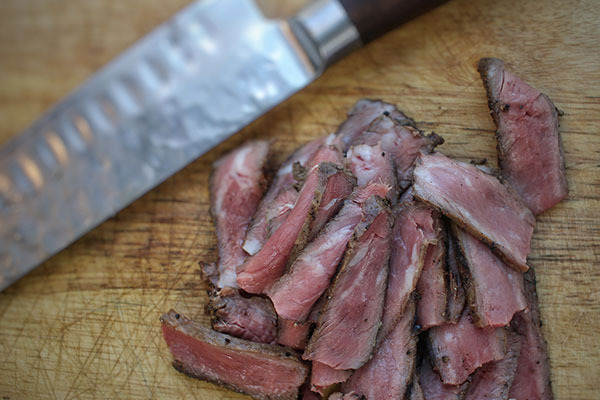 It is much easier to get thin slices of steak when it is cold. Grab yourself a sharp knife and this part is pretty easy, but if your knife is dull you’ll end up making a mess. I can’t stress the importance of keeping your kitchen knives sharp enough. If you’re worried about slicing more than the steak, get a cut resistant glove. Step 2: Heat cast iron skillet or griddle surface to medium heat. Step 3: Melt 1 tablespoon of sage brown butter on griddle or cast iron skillet. 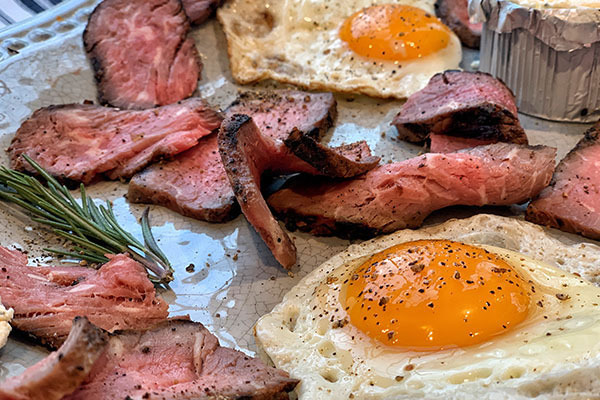 This browned butter adds a level of complexity to the leftover steak and the eggs, you’re doing yourself a disservice if you don’t at least try it. Step 4: Add thinly sliced steak directly to the melted browned butter and sauté 30 seconds. You just want to warm the steak and introduce the sage butter to it here; you don’t want to overcook it. Step 5: Remove steak from cooking surface and place on platter. Step 6: Melt additional 1 tablespoon of butter and crack 3 eggs directly onto melted butter. This might be one of my favorite sounds ever. If you’ve seen my Instagram page you’ll know I love me some eggs. For sunny side up, I cook these for 4.5 minutes without turning over medium high heat. Step 7: Add eggs to platter and serve immediately. Slice cold steak in 1/4 inch thin slices. Preheat griddle or cast iron skillet over medium heat. Melt 1 tbsp of sage brown butter on griddle or cast iron pan. Add thinly sliced steak and sauté 30 seconds. 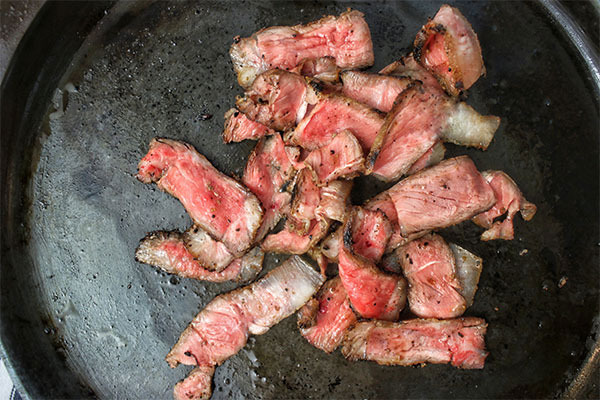 Remove steak from cooking surface and place on platter. Melt additional 1 tbsp of butter and crack 3 eggs onto hot surface. 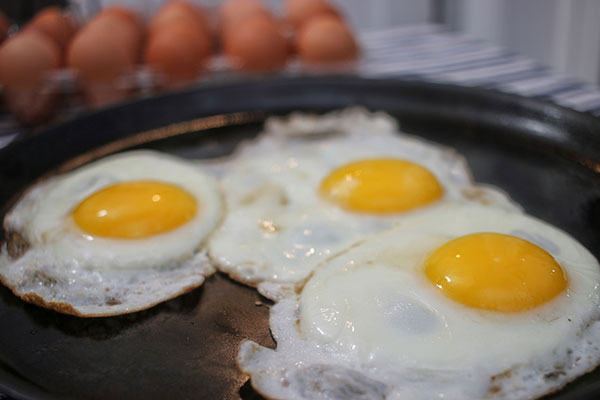 For sunny side up, cook these for 4.5 minutes without turning. Add eggs to platter and serve immediately.